In this censorship report we have compared the theatrical version with the unrated version. Both versions are on the US-DVD from 20th Century Fox (The Unrated Edition)! The violence scenes that had to be cut for a PG-13 rating are reinserted in the unrated version. However, the majority of the reinserted scenes consist of more CGI blood. In exchange there are a few good additional scenes like the one named "Chamber of Skulls", all in all the unrated version appears a bit more realistic and harder (in relation to the violence) and more complete (in relation to the storyline). 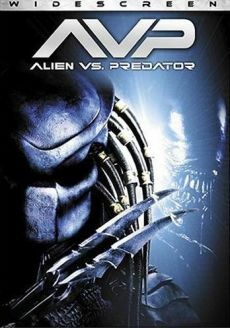 The people who didn't like AvP before, won't like the movie in this version either, just in case you thought the movie would be better in the unrated version. The unrated version is 7:53 min. longer than the theatrical version! A guy runs around, freaked out, he is chased by something. He enters a building. Inside the building he looks around scared. Suddenly a camouflaged predator appears behind him. The guy tries to escape but has no chance and is thrown against a wall. The predator aims at him with his laser. In the trap, we suddenly see from the predator's point of view, how an alien jumps from the right side towards the predator. Then we can see the claw of the predator and the opening credits begin. Length: Unrated 84 sec. longer. 3:13 min. - 3:48 min. The guy drives towards the Weyland research station and takes the pizza out of the box. Inside, he puts the pizza aside and we see his colleagues before suddenly all the computer monitors begin to flash red and the researchers run around excitedly. In the theatrical version everything up to the scene where the monitors begin to flash red is missing. The rest existing in a shorter version. Length: unrated 20 sec. longer. 6:02 min. - 6:22 min. Sebastian gets his research money canceled by his patron Juan. In the theatrical edition he simply assures his assistant that the burial chamber is safe. Length: unrated 14 sec. longer. 8:50 min. - 10:03 min. On the craft the characters are once more introduced to us in two scenes with Sebastian, who is more interested in the money than in Weyland's project as well as Alexa and Graeme, who have made themselves comfortable in their snowmobile and get a slating from Verheiden. The following announcement from Weyland by Maxwell is an alternative scene. Length: unrated 60 sec. longer. 34:13 min. - 34:16 min. In this scene nothing is cut except that the predator's claw has more blood on it in the unrated version and there is more blood splashing as he impales the mercenary. As the second mercenary gets nailed against the wall, we can see some blood in the unrated version. In the theatrical edition there is no blood at all. 37:13 min. - 38:57 min. Graeme discovers a skull together with a backbone. The group goes on with the search and finds the Chamber of Skulls a room filled with hunting trophies of the predators. Suddenly a dead facehugger falls from the ceiling and they begin to discuss what kind of animal that could be. Length: Unrated 104 sec. longer. 41:05 min. - 41:07 min. After the predator has killed Quinn, a lot more blood splashes over the rocks. 49:10 min. - 49:14 min. When the Chestburster bursts out of Rousseau, we can see far more blood as well as alternate settings. Length: Unrated 0,5 sec. longer. 49:17 min. - 49:30 min. The predators notice that their weapons are gone, they split up and start to search for them. Length: Unrated 13 sec. longer. 52:03 min. - 52:33 min. Graeme and Verheiden are trapped together. Verheiden starts to panic and Graeme tells him to be calm. Length: Unrated 30 sec. longer. 53:00 min. - 53:29 min. Connor's weapon falls to the floor in the theatrical edition, in the unrated we see an alternate setting. The reason for this is that the weapon doesn't fall into alien slime in the theatrical version and would therefore cause a goof. From here until his death, several alternate settings are used which makes this scene much more creepy in the unrated version. After he picks up his weapon, the theatrical edition changes to the next scene while the unrated shows the alien running down towards him from his viewpoint. Length: Unrated 12 sec. longer. 53:51 min. - 54:45 min. Weyland investigates the predator's weapon. Maxwell wants to know for what reason the others had to die. Weyland answers that they have made history, Maxwell thereupon asks, whose history that would be. In the theatrical version, Weyland inhales his medicine. Length: Unrated 44 sec. longer. 58:56 min. - 59:07 min. As Maxwell gets entangled in the net shot by the predator, we see more blood in the numerous settings of Maxwell and the lance that the predator pokes through the body and the wall at the end of the scene. Length: Unrated 1 sec. longer. 64:40 min. - 65:22 min. Weyland's death is more detailed. Firstly, Alexa wants to turn back but Sebastian pushes her along. In the further progress of the scene we see Weyland from behind as the bloody claws of the predator come out of his back. Therefore the closeup of Weyland is shorter in the unrated when the predator pokes his claws into him in the (off-screen!). After that, we can see some blood pouring out of his mouth. Sebastian says to Alexa that they can't help him anymore and that they have to return to the surface, this is noted by the predator. Length: Unrated 28 sec. longer. 67:56 min. - 68:41 min. Sebastian discovers why the predators hunt the aliens. It is a maturity ritual to prove that they are grown-up, a kind of maturity exam. The weapons are their reward. The changeover is shown in the theatrical edition too, but a little differently. Length: Unrated 36 sec. longer. 79:53 min. - 80:16 min. The predator disembowels the alien longer. Alexa watches him doing it. In the theatrical version there is only an alternate setting of the sentence "What are you doing?". Length: Unrated 22 sec. longer. The Unrated-version runs 7:53 min. longer than the theatrical version!